Buses have arrived in northern Syria carrying rebels and their families who were evacuated from a devastated north-eastern district of Damascus. Some 2,300 people left Qaboun on Sunday following two months of intense air strikes and artillery bombardment. The evacuations from Qaboun, and from neighbouring Barzeh and Tishrin last week, bring President Bashar al-Assad closer regaining control of the city. His forces are now expected to focus on the rebel-held district of Jobar. It is considered an extension of the main rebel enclave in the suburbs, the Eastern Ghouta, where the UN says some 400,000 people are under siege. Rebel leaders agreed to the evacuation of Qaboun on Saturday after being squeezed into an ever smaller pocket by advancing soldiers and allied militiamen. 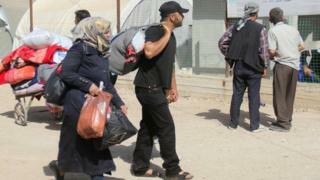 The Syrian Observatory for Human Rights (SOHR), a UK-based monitoring group, said about 1,100 fighters were among those who boarded buses on Sunday and were transported towards rebel-held areas in the north-western province of Idlib. At one point, unidentified gunmen opened fire at the evacuees as they were boarding the buses, killing at least two and wounding several others, the Observatory reported. "The regime was reinforced by Russian and Iranian foreign troops at the expense of a defenceless people," said Mohammed Alloush, head of the powerful rebel faction, Jaysh al-Islam. "The regime now plans to swallow up Jobar in the next phase before setting its sights on the Eastern Ghouta," he added. Mr Alloush said the evacuations were the result of a "betrayal" by Russia, Iran and key opposition backer Turkey, which signed a pact in Astana earlier this month establishing four "de-escalation" zones, including one covering the Eastern Ghouta but not Qaboun, Barzeh and Tishrin. Also excluded are the southern districts of Tadamun and Hajar al-Aswad, and the Palestinian refugee camp of Yarmouk, which are mostly controlled by jihadists. The government's gains in Damascus come five months after it took full control of the northern city of Aleppo and two months after evacuations from the last rebel-held district of the central city of Homs began. They also come as UN special envoy Staffan de Mistura prepares to host a new round of talks in Geneva on Tuesday aimed at finding a political solution to the five-year conflict, which has left more than 300,000 people dead. Mr de Mistura said last week that he wanted to "hit the iron while its hot" following the Astana deal, which he suggested could benefit some 2.6 million people. In addition to the Eastern Ghouta, the de-escalation zones will cover rebel-held parts of Idlib province and adjoining areas of Hama, Aleppo and Latakia provinces; northern Homs province; and Deraa and Quneitra provinces in the south. It authorises the warring parties to pause fighting for six months around them, and allow unhindered aid deliveries and the return of displaced civilians. The memorandum also calls on them to fight jihadists from so-called Islamic State and the rival al-Qaeda-linked alliance known as Hayat Tahrir al-Sham (HTS).